I am trying to install my root partition to a Btrfs subvolume so that I can have a separate subvolume that will handle snapshots. However there are no subvolume options in the installer and I was wondering if there is any way to pass special instructions to the installer to install to the subvolume instead of the Btrfs root directory (subvolid=0). Are there flags or something I can use? If so, how? Thanks in advance. The installer doe snot currently support btrfs subvolumes. I’m afraid there are no special commands that would make it work. Adding support for btrfs subvolumes is on our roadmap, though it will likely be several months before we can complete the work required. Sorry about that! @lots.0.logs Okay thanks for the reply! I guess I’ll just have to wait to do my ultimate Btrfs setup! 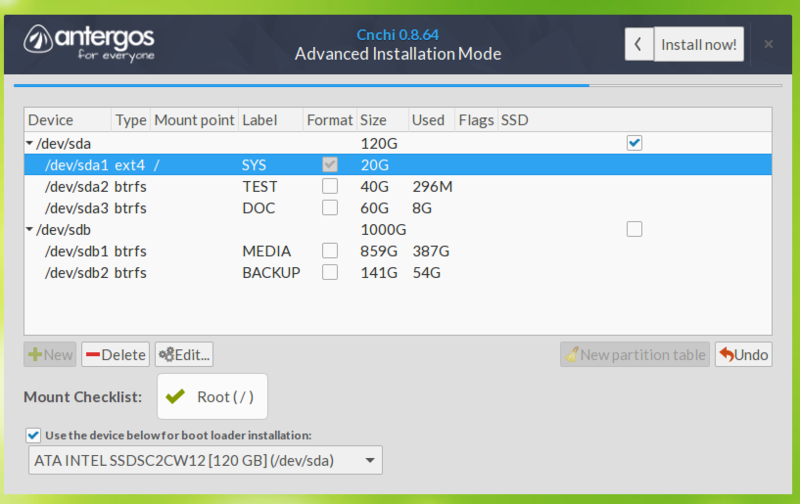 Well, a new (fresh) bug - Cnchi 0.8.64 does not support anymore installation on btrfs partitions. Installer halt at partitioning screen. 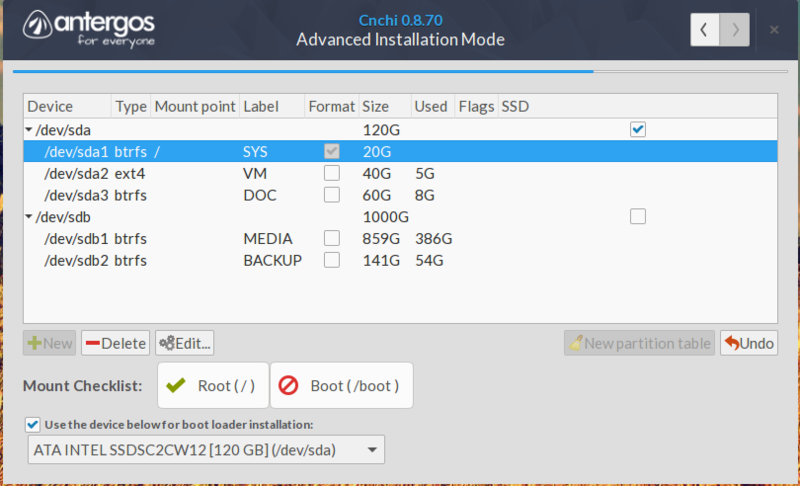 Choosing a ext4 type for Antergos (root, system) - allows me to go further. This bug appear between 0.8.29 and 0.8.64 revisions. Same problem here with the BTRFS partition. I did not try with EXT4 file system. @roberto Thanks, this has already been fixed. Screenshots are from 3 hours ago and is was not fixed. Last fix regarding install procedure was 3 days ago (link you provided). 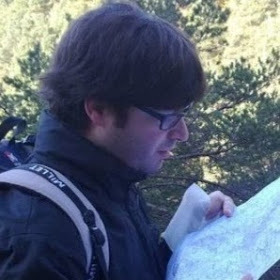 @roberto Cnchi package has been updated. It will be available as soon as all the mirrors have synced. Cheers! Also, i use sda2 (format ext4 from btrfs in order to work) and use Antergos Openbox flavour. 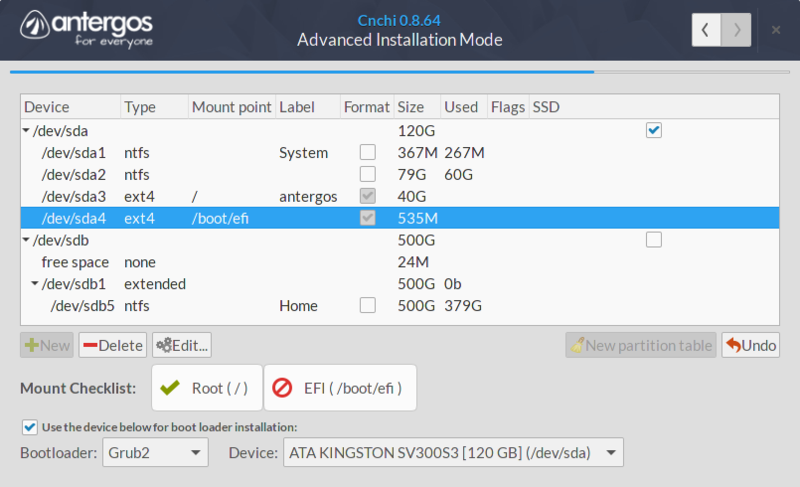 Grub recognised Antergos xfce from sda1 and updated boot menu, but it doesnt boot existing boot image from sda1 (Antergos xfce). 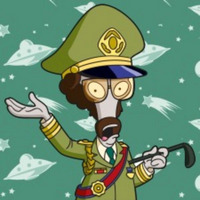 Newest image from sda2 (Openbox) is loaded. Could there be a solution for the user to mount the /installation mountpoints manually and installer just use that ? ( also not be mandatory to format the root partition ). That way for now, we could use btrfs and mount the proper btrfs subvolumes ! mount the /installation mountpoints manually and installer just use that ? Why not? Just format it with the filesystem you desire. this saves the the trouble of partitioning and shares free space between the distro’s. Its very handy and works very well! Oh, I see. I’m afraid Cnchi is not ready to work with btrfs subvolumes yet… I will talk with the other devs about not enforcing root formatting.